The Battle of Quebec on 13 September 1759, below, showing the deployment of the British (shown in red) and French forces (shown in blue) at the beginning of the action. The first anchorage of British fleets landed on 26 June. Taken from our new series A History of the British Army in 25 Battles. To read the full article, see Issue 15 of Military History Monthly. 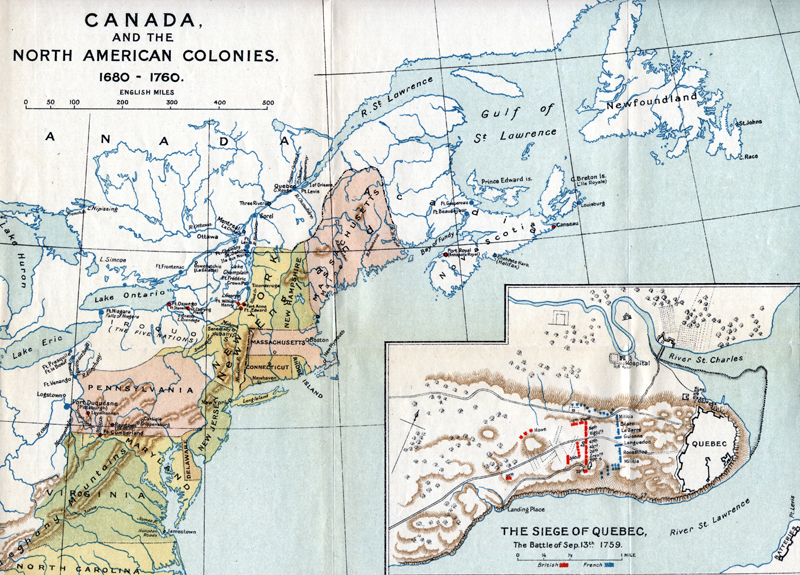 The Battle in 1759 did not “give the British dominion over North America” because it dd not defeat the French field army, which remained in existence further to the west. In the winter of 1759/60, the French field army and the British garrison of Quebec met at the Battle of Sainte Foy (slightly west of the site of the 1759 battle). The British were defeated, lost most of their field artillery, and withdrew back inside the Fortress. They remained trapped there until the arrival of the Royal Navy in the spring, following the break-up of the ice on the St. Lawrence. It was only then that the French, realizing there was no help coming for them, sued for peace.